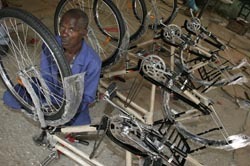 World Bicycle Relief today announced the opening of a second assembly operation in the African nation of Zambia, scheduled for Monday, June 4, in Ndola. "With this facility, we are able to expand our geographic coverage beyond the area around the capital of Lusaka," said F.K. Day, president of World Bicycle Relief. "We are well on our way to training 400 field mechanics throughout the country, and are currently delivering between 300 and 500 bicycles per week." The $2.9 million program will provide over 20,000 bicycles to volunteer, community-based HIV/AIDS care givers and disease prevention educators in Zambia in the next 12 months. It also includes training of youth and adults in bicycle maintenance and life skills, and improvements to the bicycle technologies currently available. The bicycles will be assembled in eight locations across the country. Day said he was encouraged by President Bush's request for $30 billion to combat HIV/AIDS, and believes bicycles can be a key component in the battle against the disease. "Simple, sustainable mobility in the form of bicycles is an essential tool in the fight against HIV/AIDS," he said. "There is a strong link between disease and poverty -- bicycles are a way to break that link by providing access to healthcare, education and economic development opportunities." The bikes themselves, which cost $109 each, are purpose-built and culturally appropriate. World Bicycle Relief has partnered with RAPIDS, a USAID-funded consortium of six relief organizations, to provide the bikes to home-based, community volunteers caring for their neighbors affected by HIV/AIDS, including orphans and vulnerable children. These caregivers utilize the bicycles to increase their reach fourfold: while walking, they might cover 2-1/2 miles per hour; by bicycle they are able to go 10 miles. This allows them to better attend to their caseload, and at the same time decreases fatigue and helps them to further contribute to their families and communities. World Bicycle Relief has also launched a pilot program to extend its scope to include micro-loans for bicycles in Zambia and other countries in Sub-Saharan Africa. At the same time, Day said, he is working with suppliers to increase the quality and durability of the bicycles available. More information is available on the group's web site, www.worldbicyclerelief.org.